Do you celebrate Valentine’s Day with your children or students? The “day of love and friendship” can be FUN with a little planning and a few special activities! 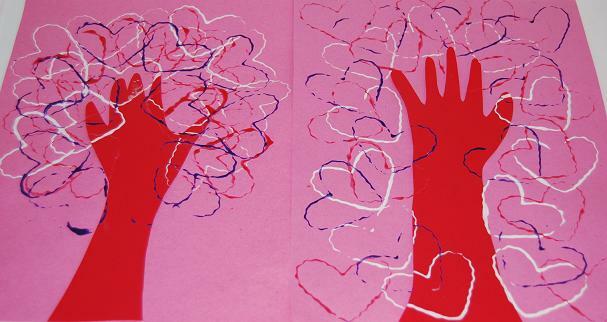 Materials needed: Red Construction Paper (one per child), Pink Mounting Paper (one per child), assorted Valentine’s colors of washable tempera paint, heart shaped cookie cutters, paint smocks (or an old T-shirt) to protect clothing, scissors, glue sticks, and paint trays or paper plates. The children will make prints in various fashions….each tree will be as unique as the child making it. The trees make wonderful classroom displays or presents for parents/grandparents at Valentine’s Day! Materials needed: Rectangular strips of colored paper, squares of pink and red paper (we used paint strips just because we had some available, but ANY colored paper will work), permanent marker, clothespins, and a tray. 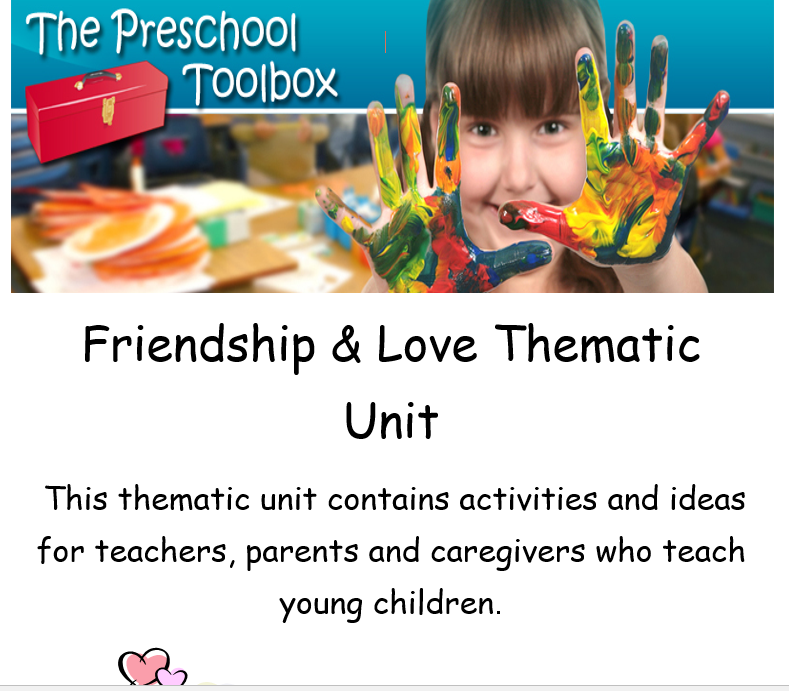 Label a rectangular strip of colored paper with any word or phrases the children know. 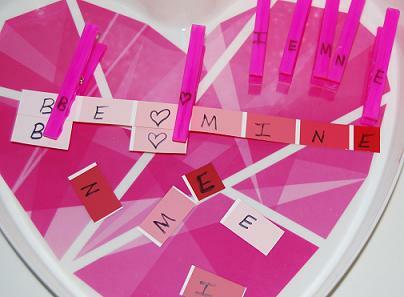 In the photo above, we labeled our strip with the letters for : BE MINE! Duplicate those letters onto the squares of colored paper. The tray should include: the rectangular strip (labeled with the word or phrase), clothespins labeled with each letter in that word (or phrase), and the labeled squares of colored paper. Have the children find the matching letters/clothespin and work to clip the corresponding letters together with the clothespin. It is great fine motor work for tiny fingers while practicing letter recognition, too! 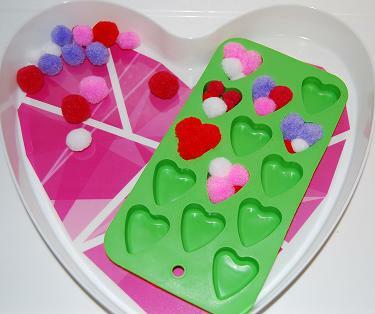 Materials needed: Assorted sizes of pom-poms in Valentine’s Day colors, a Valentine’s Day Ice Cube Tray or Chocolate Mold (we found many at our local dollar store), and a tray. Set the assorted sizes of pom-poms and the chocolate mold on a tray. Ask the children to fit as many pom-poms into each of the individual molds as necessary to completely fill the mold. After each of the molds are filled, have the children verbally count how many pom-poms they used to fill each individual compartment. This activity seems so simple, but for little fingers, it is a fun math/fine motor skills lesson. Print the file above (linked in blue) for each of your students. 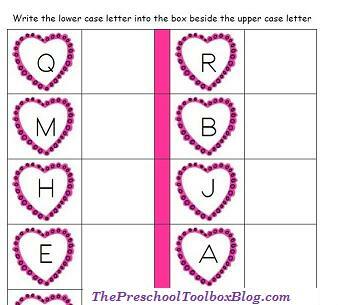 Have your children use alphabet stamps and stamp pad to stamp the lowercase letter that corresponds with each letter enclosed within the hearts. Younger children can use ONLY uppercase alphabet stamps. **Note: for very young children, work on only a FEW letters at a time. Place a few alphabet stamps into a basket and have the children find the alphabet stamp that corresponds to one of the few hearts chosen to introduce. The children can also use old magazines and cut out pictures that BEGIN with each letter enclosed within the hearts on the file. Older children can WRITE a word that begins with each of the letters enclosed within the hearts. 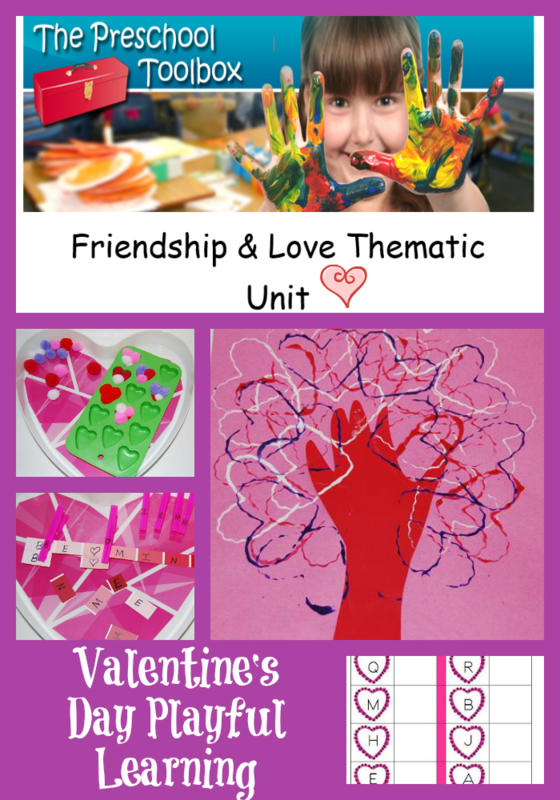 For MORE ideas, activities, and crafts for Valentine’s Day, download our Valentine’s Day Thematic Unit here on the blog! « Make Your Mark eBook: Guiding Preschoolers through PLAY! Reading this info So i am glad to convey that I’ve an incredibly just right uncanny feeling I came upon exactly what I needed. I such a lot undoubtedly will make certain to do not fail to remember this website and provides it a look on a continuing basis. For the heart tree project, do the heart shaped cookie cutters have to be metal? Or can they be plastic cookie cutters? Aimee – metal ones work best, but we’ve done with plastic cutter, too. The kids just have to circle the cookie cutter in the paint a bit more to coat it well. Thanks for your question!